With a lot of strawberries in the house after a couple of trips to the Wild Things Farm, I had everything needed to make this cold, refreshing and beautiful drink. 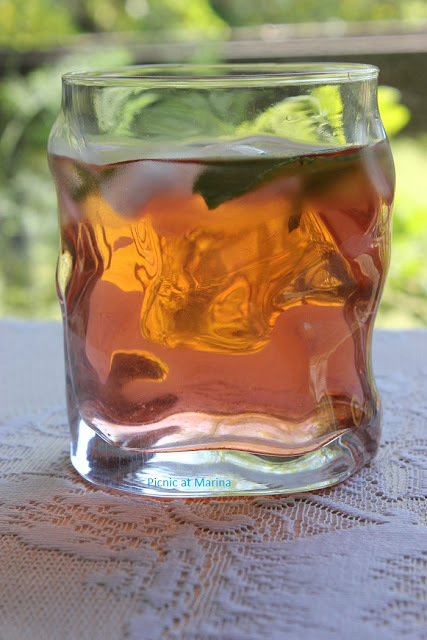 You need a cup of strawberries, cut; 4-5 fresh mint leaves, 2 liters (1/2 gallon) of water and sugar to taste. Sugar actually is optional (but mandatory for the Teenager!). Place all ingredients in a small jar (enough to fit), boil some water and pour to over the strawberries. Cover it with a coffee filter and let stand for 12 hours (I usually leave it overnight). Then stir the infusion and transfer through a strainer into a pitcher. Add the remaining water and enjoy! Strawberries and mint wed perfectly in this drink. And your kitchen would smell so good you would want to linger there longer, maybe to make some dessert?! 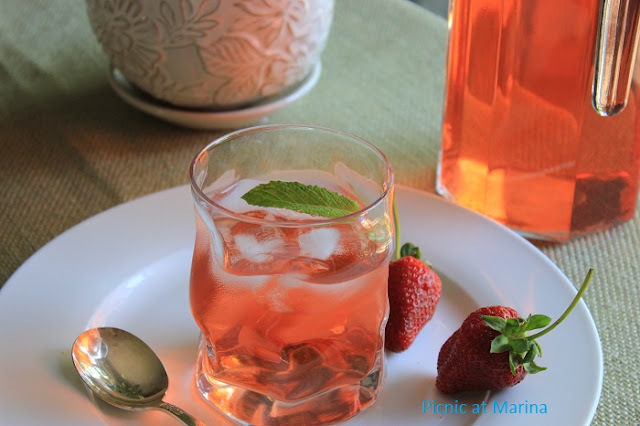 What is your favorite way to use strawberries? I like it with whipped cream sometimes too. I agree with you, eating them alone, especially when they are right off the garden, is the best way. Oops. I meant WASHED them. Thanks Lorraine. Strawberries with cream are delicious indeed! With ice cream sounds very good, I need to offer it to my men! Beautiful and yummy post! I see great minds think alike! Yes indeed! :) I am glad you like it, Yvonne! Oh yes, I do want a jar! I can only imagine the taste... soo good! 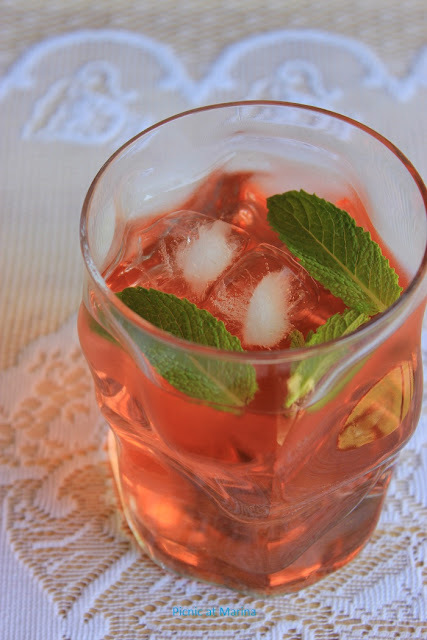 This looks like such a refreshing drink. I am sure we would all love this at home. I have 2 boxes of strawberries in the fridge right now. Going to make this tomorrow. Let me know how you like it, please! And have a wonderful weekend! This looks so refreshing! I'm quite literally dying of thirst after looking at the gorgeous photos. Thank you Valerie! I like to enjoy the strawberries off the box too, off the garden is even better! Have a great weekend! Valerie and I think alike. Right out of the box if they are really fresh. Otherwise it's in ice cream or tarts, or in a pie with rhubarb - I can't decide! Yes indeed, when strawberries are really fresh, garden fresh, they don't need any "dressing". Have a lovely weekend, Maureen! Wow, that's an interesting recipe. Can you share it? I would love to try!